Some victims had scratches made on window frames as if to mark he'd been there. Another theory for the erased houses is houses for sale or vacant lots. Nice theory Gskonstracker. Thanks Tracker and Truth on the how to's for getting screen shots. 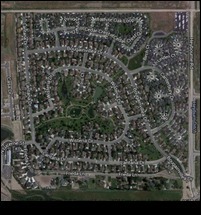 The first pic is of a subdivision in Minden NV. Even though the streets are different the style seems very much in line with map drawing. Also the physical lay out of the land seems similar. I would be very interested in knowing who planned this location. The second pic is of Hollister and Storke in Goleta. I have been looking at this location for a while now. I rotated the pic one turn counterclockwise. I believe if you look at the physical lay out of the map and this area they match up very well. The area I highlighted in light blue would be a very reasonable place for a man made lake. The spot is also as close to the freeway as the map shows. The commercial area is similar also, including the area from the Hollister to the freeway. Though not a perfect match, it could be more of a "camel" than the "horse" that the drawer of the map envisioned. I would like to emphasize that most of the people I work with always try to orient their maps and drawings to north and south. And while I don't have experience creating these maps, I have fifteen years experience interpreting them to complete my work. I would think whomever was the drawer of this map did this also and that there is a good chance that north would be to the left side of the page also. Imo, I don't think that the drawer drew this map to scale and therefor the houses and streets of the map wont match up correctly with the actual location. I would be very interested in knowing the ownership history of this area and who had options to build on it in the 60's and 70's. I know the Towbes group owns the Storke research center on the north west corner of the intersection so I would be interested in knowing if they had a role in the whole areas development or who they bought that parcel from. It seems unlikely, but I'm going to say it: is it possible they planned on "building" a lake, but didn't? Maybe had started excavation, but couldn't get the permits, etc.? I don't know why someone living in SB would want to live near an artificial lake, but stranger things have happened...maybe it was more accepted in the late 70s? I didn't know that creating 'fictitious' maps had such a big following, some of these drawings are amazing. I would like to present a hypothesis regarding the map. The lake on the map roughly corresponds to Lake Los Carneros, which is located about 2 to 2.5 miles to the west of the area where the Goleta attacks took place. Though the contours are not exactly the same, the proximity to the freeway is a significant parallel. Also, if you notice the road ending in a kind of roundabout to the left of the northern part of the lake on the ONS map, there is a large historical house at the end of a semicircular driveway in roughly the same area to the left of the lake. The north-south direction of the lake's inflow and outflow also fit the ONS map. If ONS rode bicycles in the general area next to where he committed his crimes, he undoubtedly came across Lake Los Carneros. 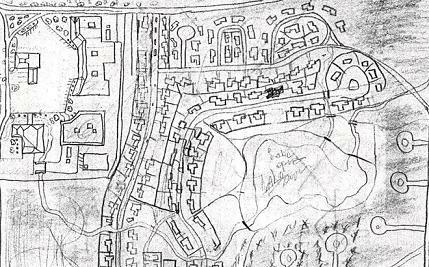 Perhaps the map comprises homework by the ONS from a class in real estate/planned community development. Or it may represent an imagined development that ONS dreamed of building someday. A blue-collar worker who dreamed of someday being "the Man." That fits with the words of Excitement's Crave: "Accepting some work to perform/At fixed pay, but promise for more. . ." and "Achieving while others lifting/Should be cause for deserving fame." I see they are claiming the map is of a neighbourhood in Goleta. I looked but haven't found it. 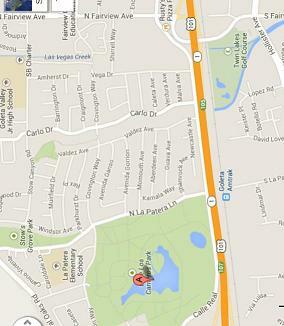 The general layout around Lake Los Carneros Park seems to match generally but not any of the details on the map. Not sure if the poster Traveller1st read the post by jigisup here or come to that idea about Lake Los Carneros on his own. The buildings part has some relation to the schools here, as if he joined them closer on his map then they are in real life. The buildings match even closer to the are around Hollister and Storke, which is very close to the lake. Do you think I have the correct orientation? Akwilks -- I was thinking that the orientation should be flipped 180 degrees. But your idea is interesting. 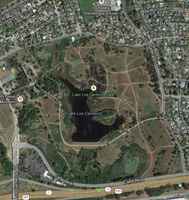 The contour of the street between the structures on the left and the lake development is similar to the contour of Covington Way, which is on the north side of Lake Los Carneros. The thing is, the structures you suggest as the school (La Patera) don't really fit the layout of the school. And, as you point out, the map does not account for existing development between the school and the lake development. If you flip the map as I suggest, the buildings adjacent to the lake development could be future commercial development envisioned by the map maker at the corner of Calle Real and Los Carneros Road. Regardless of the orientation, I continue to float the idea that this is a rough sketch for a school project in a real estate development class based on the undeveloped area of Lake Los Carneros. It looks like something a young person with no cartography or drafting skills would have come up with. Whoever drew it also exhibits no understanding of hydraulics -- see how the outflow drainage flows right into the buildings on the left. Interesting points about the lack of formal drafting skills, and the drainage not making sense. It would seem clear at this point that this map doesn't represent a real neighborhood. 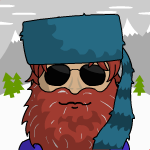 Therefore it would seem to represent a doodle by someone with a construction background and an interest in development. I am not sure why Larry Pool stated that the map was a "carbon copy" of a Goleta neighborhood. I think he was just saying that it was similar. Interesting thoughts. Something is going on in this hand drawn map that is weird - like he is basing part of it on Lake Los Carneros and part on something else, potential construction or another area. 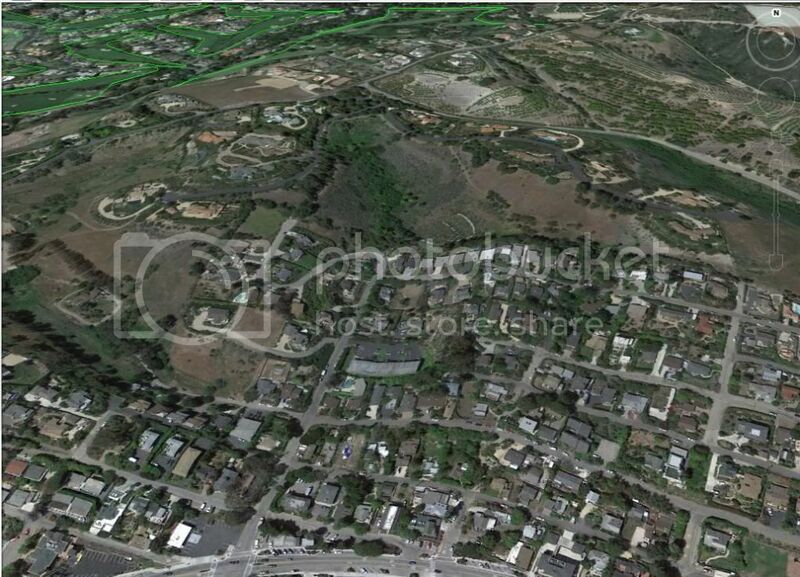 Above here how close in Goleta - Santa Barbara County the Offerman - Manning murder was to the Domingo - Sanchez murder. And the Domingo - Sanchez murder was just minutes from Gaviota Beach, the site of the 1963 Domingos - Edwards murder! Maybe we have a killer here like the shark in "Jaws" - he is expressing terroritoriality. IMO the ONS is saying "I can kill where ever I want. I can kill someone, then come back to the exact same neighborhood, just a block away, and kill someone else, and you can't stop me. Catch me if you can...but you can't. I am too smart." Very much like, IMO, to the first 3 Zodiac murders - similar close distances! These are the two Goleta murder scenes and Lake Los Carneros. It would seem much more reasonable to commit one attack in an area that you are otherwise not very familiar with, than to commit two attacks there. I would find it hard to believe that EAR/ONS did not know of Zodiac attacks in such close proximity to each other, and his own later attacks. I think that EAR/ONS may have been a Zodiac copycat of sorts. 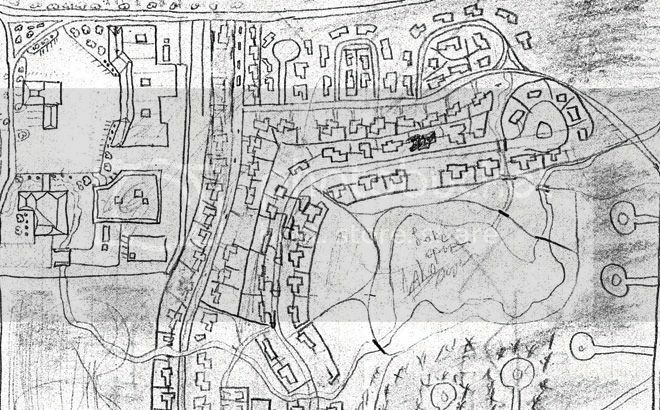 A particular area of the neighborhood where the Goleta attacks took place has intrigued me since I first learned of this case. Look at the undeveloped property in the lower-center part of the neighborhood. It appears to have been a farm -- there are various outbuildings present now. Consider its proximity to San Jose Creek, where there are bike/foot paths. In all of the attacks except for the Toltec crimes, the most direct route of escape is a diagonal line across the undeveloped property to the creek and eventually to Highway 101 or wherever he had parked his car. (Wish I could illustrate it with a computer program but I don't know how.) Perhaps the ONS had visited friends at the property or even lived there. On the other hand, it might have been a vacant field through which he rode his bike in several middle-of-the-night flights. Still, I wonder who owned the property at that time and what the property had been used for. If the owner is still alive, did he ever see anything or run into anyone appearing unusual at the time of the crime spree?